The Columbus Canyon trail is located in the Colorado National Monument near Grand Junction, Colorado. 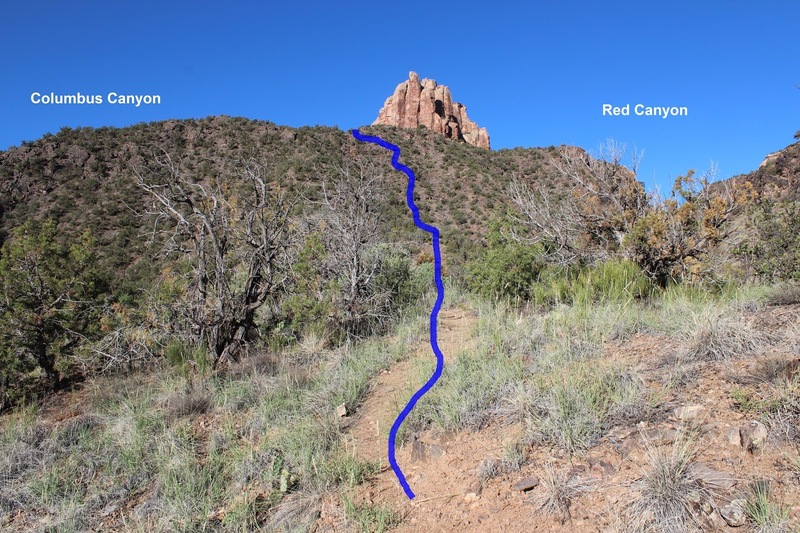 The trail begins near the east entrance at the Devil's Kitchen Picnic Area where it travels north along the border of the monument to the mouth of Red Canyon. 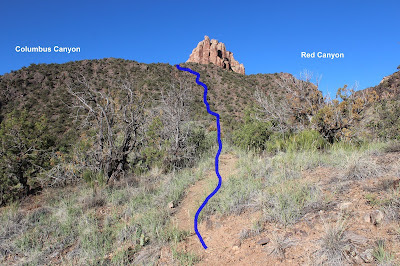 From there the trail follows the route into Red Canyon for a short distance before branching off into Columbus Canyon where it makes a steep climb to an upper bench and then works its way into Columbus Canyon below Cold Shivers Point. The trail follows the base of the canyon until the canyon becomes too choked with debri to continue. Devil's Kitchen is a picnic area located just inside the monument near the east entrance. 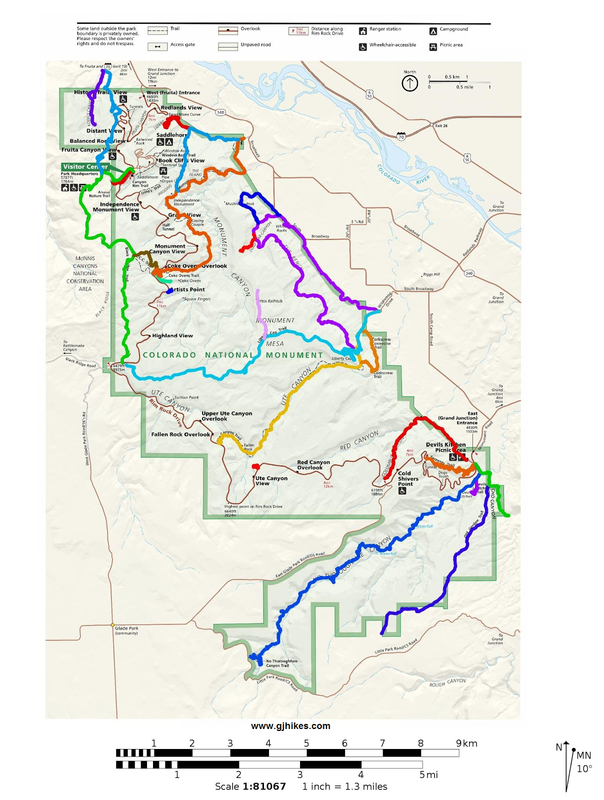 The route that this post follows isn't on the official trail map for the monument but the park rangers do conduct tours from time to time that begin at the picnic area and go into Red Canyon. From the picnic area follow the paved route that heads north away from the restrooms and shelter. The pavement will end after a short distance. Continue on the wide hard packed dirt trail. The trail will reach the top of a little rise. What you want to aim for is a gap in the cliff that is visible from this spot. The trail gets a little narrower at this from here and much more primitive as it works its way toward the box canyon ahead. Once you drop into the drainage of the box canyon turn east, or to your right, and scramble your way through the gap. This is a picture of the gap that we are referring to. The slideshow at the end of the post has a few pictures of the trail leading up to it. Once through the gap pick up the faint trail that leads north between the monuments boundary fence and the hillside. The big sagebrush obscures the route at times and the trail tends to get braided with game trails but if you keep going toward Red Canyon, the next big canyon along the face of the monument, and stay just inside of the fenceline then any of the trails should get you there. Along the way you will pass an old homesite. This is now an archaeological site, and it is within the monument anyway, so be careful not to disturb it in anyway. It is unlawful to vandalize the site, dig around it, or remove anything from it. Continue to pickout the easiest route just inside the fenceline. 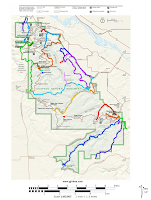 It is about 1.2 miles from Devil's Kitchen Picnic Area to the mouth of Red Canyon. As the route turns into Red Canyon there is a choke stone that you will need to scramble around. After you get past it stay in the base of the canyon to continue. The mouth of Red Canyon is very scenic and a pleasure to hike or stumble around in. It is a good family hike up to this point that the outdoorsy sort of clans will thoroughly enjoy. 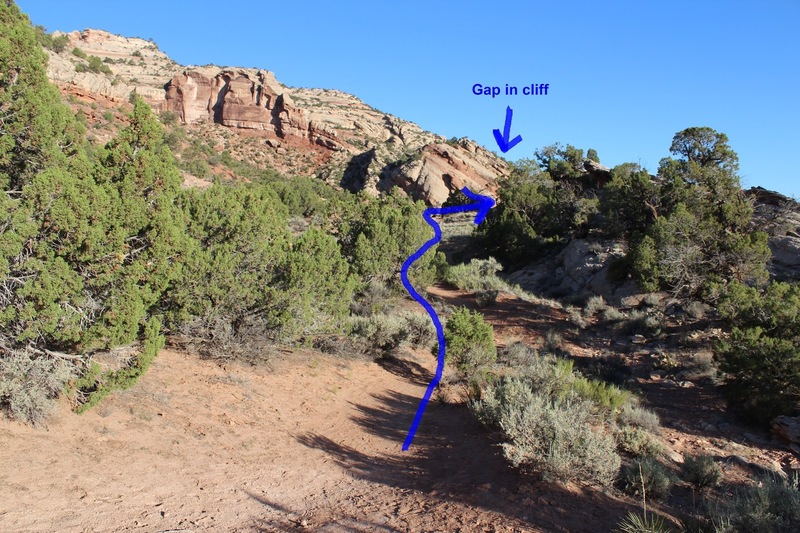 After the trail works its way through the narrow part of the canyons mouth it comes to the point where it splits. This is the point of decision where you must decide whether to make the climb up the steep hillside for the next stage of the hike. The trail has a lot of loose rock and scree in places and is not an easy climb and not much better coming back down. There are a few cairns but route finding can be difficult at times. We have been in here several times and speak from experience. If you would like to make this your turnaround point you might consider going a little further to the right into Red Canyon first. You can only go a short distance before you reach a giant spillover but it is very pretty. If you continue and manage to stay close to the cairned route you should reach the bench just below the prominent point known as Gypsy Towers. Rock climbers used to come and climb the Gypsy but since all the subdivisions along the monuments border have choked off access into the canyon it doesn't see near the people that it once did. If you continue any further into Columbus Canyon you will be doing so without the aid of a trail to follow. There are some difficult scrambles until you reach the area below Cold Shivers Point. From there you can follow the streambed in the base of the canyon. Eventually you will reach the point where it doesn't make much sense to go any further. As you hike back out you can admire all the junk that litters the canyon below the overlook. Some of it may have been stuff that fell into the canyon when Rim Rock Drive was originally constructed. 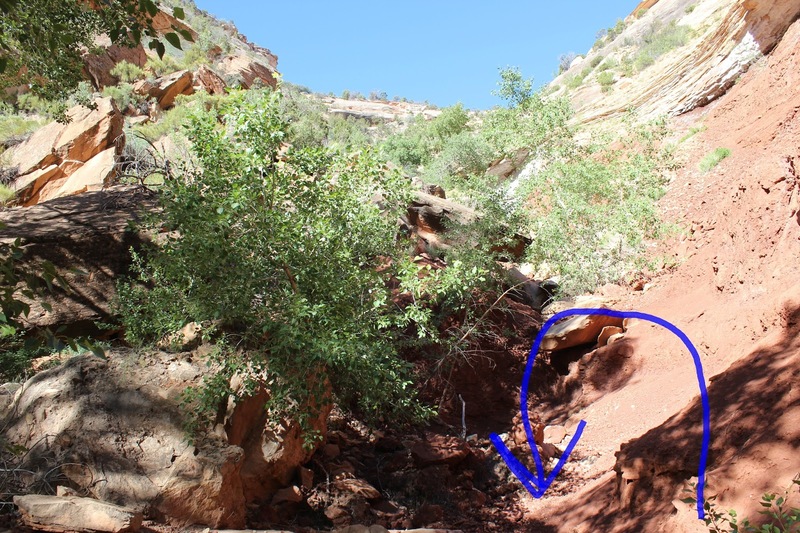 We really don't recommend anyone to hike all the way into Columbus Canyon but we know that people do because they send us emails and ask questions about it and also about the upper reaches of Red Canyon. For those that are bent on doing it be sure to prepare well and be ready for a tough hike. If you would like to see it for yourself then all you have to do is 'Take a hike'.